When it comes to remodeling, it’s often just easier to knock things down and start from scratch than it is to make calculated changes from within. The downside of this route is that it can result in a hodgepodge design compromise, and, ultimately, in the loss of a home’s heart. 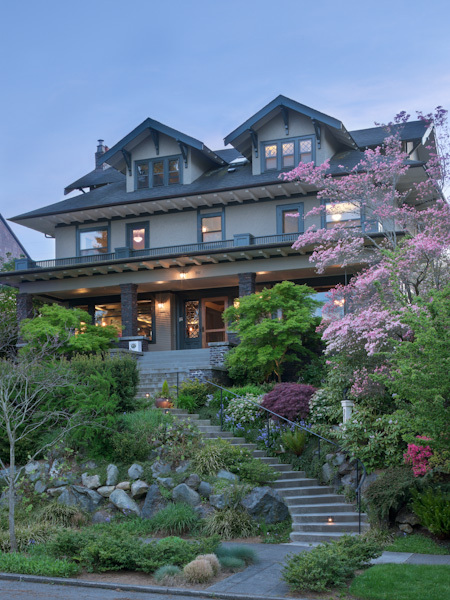 Christine and Eric Larsen, and their architect, Jim Castanes, chose the harder path of a refined remodeling when it came to readying a Capitol Hill house for the modern world. Architect: Jim Castanes, AIA, Castanes Architects, Downtown, 1931 First Ave., Suite 828; 206.441.0200; jim@castanes.com; castanes.com. General contractors/carpentry (including green roof, wine room, play loft): Toby Taylor, Caledonia Bay Builders (closed), Ryan Crossman (formerly with Caledonia), Madrona Builders, Edmonds; 206.335.0437; ryan@madronabuilders.com. Structural engineer: Jim Harris, Putnam Collins Scott Assoc., Seattle; 206.292.5076; pcs-structural.com. HVAC/ radiant heat: Tom Miller, Heat N Air, Tacoma; 253.363.5783; gr8heatman@comcast.net. Electrical: Eric Pettersen, Pettersen Electric; 206.255.8208; eric@pettersenelectric.com; pettersenelectric.com. Plumbing: Jeff Keehr, K&B Plumbing; 253.261.5233; kbplumbinginc@gmail.com. Millwork supplier: Tom Wolf, Western Pacific; 425.773.5195; footinthedoor@frontier.com. Interior design consulting (preliminary kitchen concept, backsplash selection): Robin Chell Design, Ballard, 3417 NW 68th St.; 206.760.0849; robinchelldesign.com. Color/materials consultant: Anne Viggiano Color & Design; 206.999.0008; avcolordesign@me.com; avcolordesign.com. Interior/exterior painting: Anour Abdou, Sierra Painting; 206.992.9198; sierrapainting@gmail.com. Specialty painting (dining room panels): Jeffrey Tritt & Assoc. ; 206.718.6974; jeffreytritt.com. Interior paint: YOLO Colorhouse; yolocolorhouse.com. Tile install (kitchen/powder room backsplashes, steam shower, basement bath/laundry floors): Joe Lambert, Tile Craft; 253.318.6615; joetilecraft@aol.com. Plumbing fixtures: Seattle Interiors, Wallingford, 3822 Stone Way N; 206.633.2900; seattleinteriors.com. Kitchen cabinetry/island: Quarter-sawn Sapele, Kevin Laso, Acorn Custom Cabinets, Newcastle; 425.235.8366; acorncabinets.com. Kitchen backsplash: Barbara Barry, Ann Sacks, Belltown, 115 Stewart St.; 206.441.8917; annsacks.com. Kitchen island/countertops: Granite, Skyline Tile & Marble, Woodinville; 425.485.2000. Select hardware (basement door knobs): Rejuvenation, SoDo, 2901 First Ave. S; 206.382.1901; rejuvenation.com. Kitchen cushions/living room chairs/bench fabric: Archive Edition Textiles; archiveedition.com. Wallpaper: Bradbury & Bradbury Art Wallpapers; bradbury.com. Select period lighting: Bogart, Bremmer & Bradley, Greenwood; 206.783.7333; bbbantiques.com; Antique Lighting Company; antiquelighting.com. Furniture (master bedroom/living room/bar stools): Masins, Bellevue, 10708 Main St.; 425.450.9999; masins.com. Bifold doors: NanaWall; 800.873.5673; nanawall.com. Patio pavers (sunken garden): Appian Construction, Woodinville; 425.483.0400; appianconstruction.com. Outdoor furniture: Restoration Hardware; restorationhardware.com. Landscape/hardscape design: Chip Ragen, Ragen & Associates, Capitol Hill, 517 E Pike St.; 206.329.4737; ragenassociates.com.